DEL MAR — In the wake of recent mass shootings in Riverside, Orlando and Dallas, about 20 area residents rallied for gun violence prevention and in support of the Safety for All gun control initiative on July 9 near the Del Mar Fairgrounds, where the two-day Crossroads of the West gun show was getting underway. A few months ago Dernetz started Our Town for Gun Safety, a local group whose goals are similar to those of Everytown for Gun Safety. That nonprofit organization, founded in 2014 by combining Mayors Against Illegal Guns and Moms Demand Action for Gun Sense in America, works to support efforts to educate policymakers, the media and the public about the consequences of gun violence. “We’re very interested in the issue of gun safety,” Dernetz said. “Many Del Mar and Solana Beach residents agree that there is an urgent need to do something about gun violence. We want laws that keep guns locked in safes when they’re not being used. County Supervisor Dave Roberts attended the event to support mental health programs. “Incidents of gun violence almost always are tied by a common thread of a shooter who needs serious mental health treatment,” he said, noting the county has budgeted more than $500,000 to expand mental health programs. He said he and his colleagues have increased the number of psychiatric emergency response teams, which accompany law enforcement to scenes of mental health crises, and passed legislation that allows the county to maintain custody of a severely mentally ill person for up to 30 days with approval from a judge. “We are providing the tools, resources and services needed to keep our communities safe so that people with severe mental illness don’t take weapons to harm others or themselves,” Roberts said. The Safety for All initiative, which will be on the November general election ballot, is a proposed California law that would prohibit the possession of large-capacity, military-style magazines, treat ammunition sales like gun sales and require that lost or stolen guns be reported. It will also share data with the federal system on prohibited people and ensure people prohibited from owning guns do not possess them. 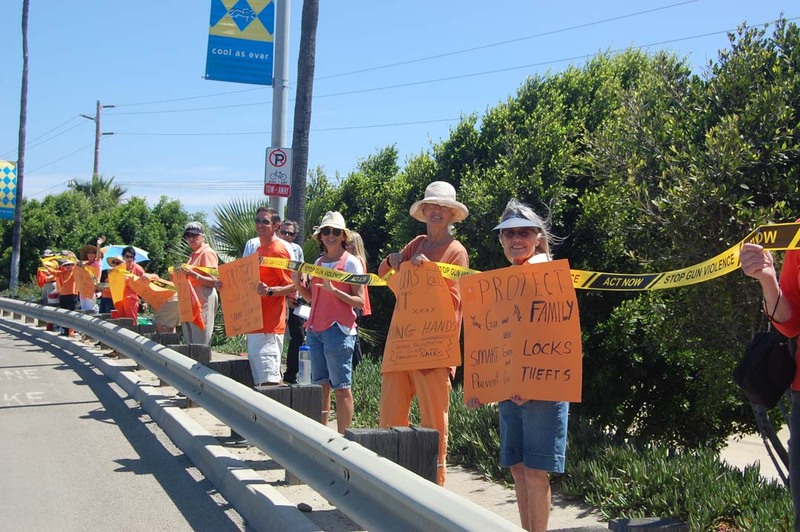 Wearing orange T-shirts, participants at the Saturday rally stood across from the main entrance of the Del Mar Fairgrounds for about two hours waving at passers-by. They held handmade signs and a 1,000-foot tape banner from YellowTapeProject.com, a campaign advocating for responsible gun regulations nationwide. He and Rose Ann Sharp, who helped organize the event, said they were happy with the turnout. “We were extremely pleased that we received so much support both from people passing by and, more importantly, from people leaving the gun show,” Sharp said. “Mostly they honked or waved. Some did not or avoided eye contact. “With so many senseless killings last week, I think citizens realize that it is time to deal with the problem in a commonsense way,” she added. 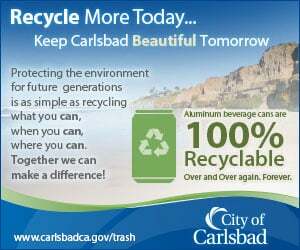 Past efforts by the city of Del Mar to stop gun shows at the fairgrounds, including an adopted resolution a few years ago, have not been successful. In 2013, the president of the board of directors that governs the state-owned facility asked his colleagues if they wanted to discuss the request but none did.